Tomatoes (medium sized) - 1-2 (75g) cut in very small pieces. 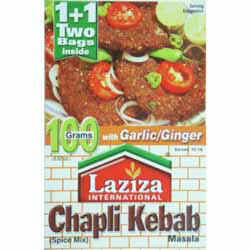 • Mix well Laziza Chapli Kebab Masala (one bag) in mincemeat. Now add whisked egg, onion, tomatoes and mix/knead well to make smooth dough. Leave for 30-45 mins. • Make thin flat large kebab with wet hands. • Heat ghee/oil and fry kebab on low fire/flame until tender or completely fried. Serve with fresh salad & chutney. "Dear Spices of India, Excellent service & Packaged well. I ordered the goods on Wednesday evening and they were to delivered to my door, Friday Luchtime! Many Thanks."